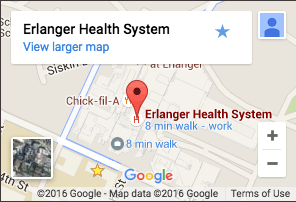 Why Children’s Hospital at Erlanger? Because children’s physical and emotional needs are unique. When ill or injured, they require specialized care and equipment. They deserve a hospital where caregivers know hugs play an important role in healing, where laughter is prescribed in large doses, and where the whole family can find comfort in times of worry and stress. Children’s Hospital at Erlanger is this special place. We’re the region’s only hospital staffed with pediatric subspecialists, who, along with highly-trained pediatric surgeons, nurses, respiratory therapists, pharmacists and child life professionals, have devoted their careers to working with children. We know that providing the best in children's health care takes more than special equipment or training – it takes viewing the world from the unique perspective of children and understanding what they need. Creating this special environment of healing for all children, regardless of their ability to pay, is the daily and ultimate goal of everyone at Children's Hospital at Erlanger. No other facility in the region can say they do the same. In addition to the emergency, trauma, and intensive care services listed above, Children’s Hospital at Erlanger has a comprehensive list of subspecialists from pediatric cardiologists to pediatric urologists. Click here to learn more.